The holidays are right around the corner! 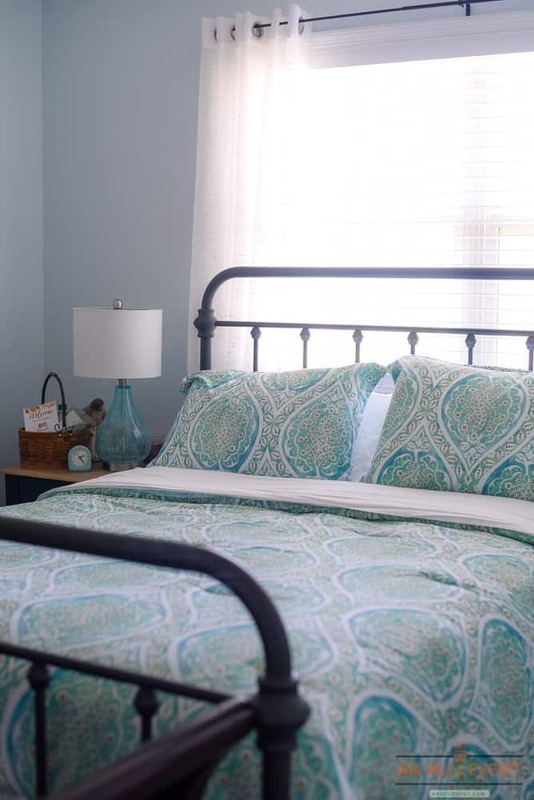 Are you ready for overnight holiday guests? I can remember a time when the thought of hosting weekend guests would send me over the edge. My husband would jokingly (I think) tell me we could not remodel the home just because we were having guests. I’d agonize over things like what to serve for breakfast, check to see if the house was squeaky clean enough and if I really had time to reorganize every closet in my home. I confess, I still go overboard on cleaning, but at least I get rave reviews on my breakfast ideas. Over the years, I’ve finally learned to relax when it comes to entertaining! Holiday guests aren’t looking for perfection. They want to spend time with their host and make memories to cherish forever. That’s why I focus on making my guests feel welcome and comfortable. I have breakfast ideas planned that are easy and delicious and not overly fussy. I also have a few go-to tips I always implement when entertaining holiday guests. 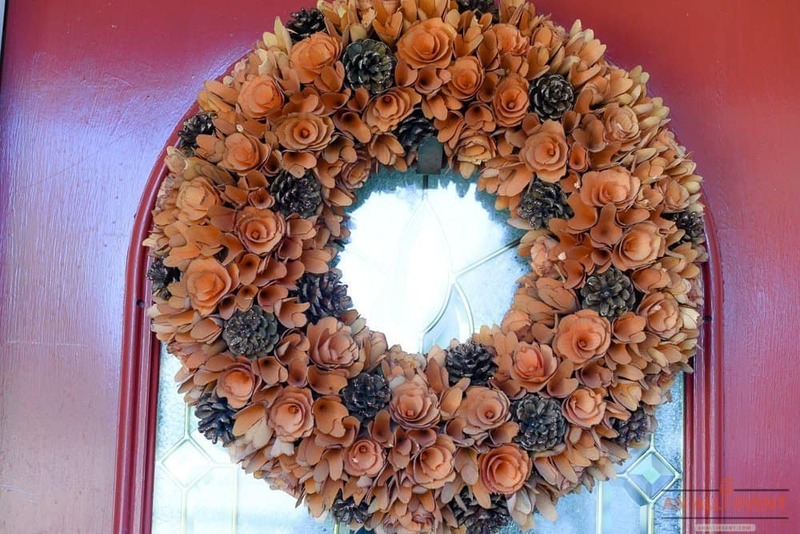 A simple, festive holiday wreath is all you need to welcome your guests. Of course, you’ll want to make sure the porch is swept and a welcoming doormat is in place. I always make sure there’s an extra blanket in the guest room. The bedside table holds a lamp, reading material, and a clock. I also include a welcome basket or tray stocked with bottled water, chapstick, tissue and a little chocolate because chocolate makes everything better. A welcome note with the WIFI password is another item I include in the welcome basket. My overnight guests always remark how much they love this special touch. Unless you have somewhere to be first thing in the morning, your guests may choose to sleep in. If you’re an early riser like me, you have time to workout and set the buffet table for your guests. I always have a breakfast buffet when hosting overnight guests. An overnight breakfast casserole that’s cooks in the slow cooker is something I always serve. I have a few go-to recipes, but my favorite is one that includes hash brown, eggs, and sausage. I always include a couple of cereal options. My new favorite is Maple Cheerios. 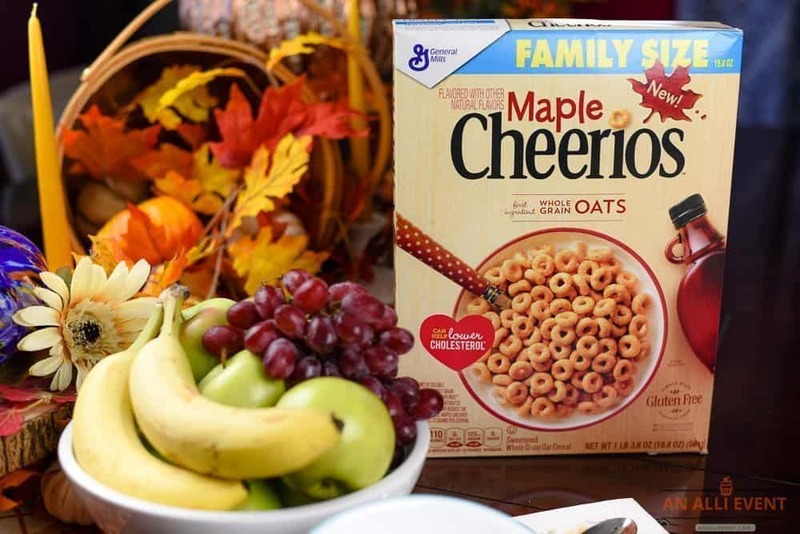 Have you seen Maple Cheerios at Walmart? This cereal is perfect for my holiday breakfast buffet. 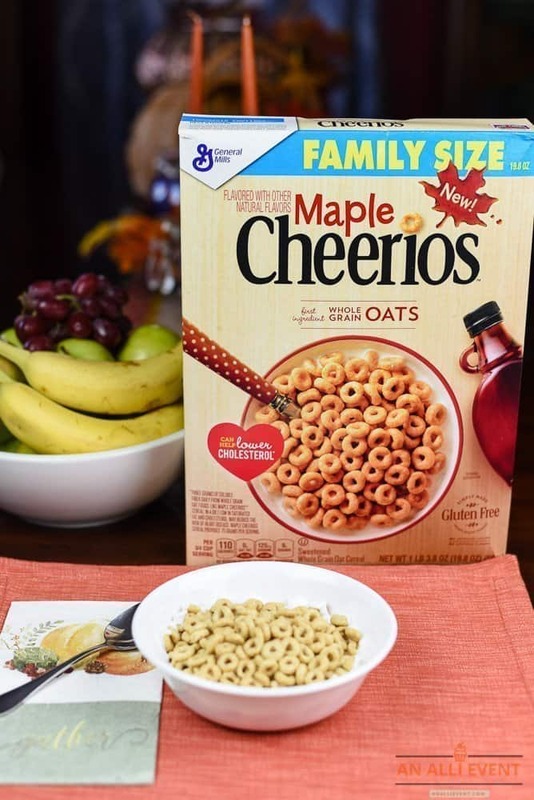 Maple Cheerios is made with real maple syrup and is gluten-free. Another cereal on my breakfast buffet is Peanut Butter Chocolate Blasted Shreds for all my chocolate loving guests. We’ve always been a Cheerios family. I remember when my kids were toddlers. I never left the house without a container of Cheerios in my purse or diaper bag. Now that Maple Cheerios have arrived at Walmart, I now have a new favorite! If you’re entertaining guests during the holiday season, take a deep breath, relax and use my tips and breakfast ideas. Yum we buy honey nut now but these sounds super yummy. Who doesn’t like the flavor of maple syrup? We will be having the in-laws over for Christmas this year. We like to make our room comforting for them when they stay. I love the sheets you used on your guest bed. They are gorgeous! A great breakfast does make the next morning so much more fun and brighter. Maple syrup is a new flavour I have to try! Haven’t tried those maple Cheerios yet but those PB Shreds are delicious. We KEEP Cheerios in our house. The kids will eat them straight from the box without milk just like they did when they were toddlers. Haven’t tried the Maple Cheerios yet but we love the PB Shreds. We always have Cheerios in the pantry. The kids still eat them straight from the box like they did when they were toddlers. I usually give our guest bedroom a once over. That Cheerio with Maple sounds really yummy! 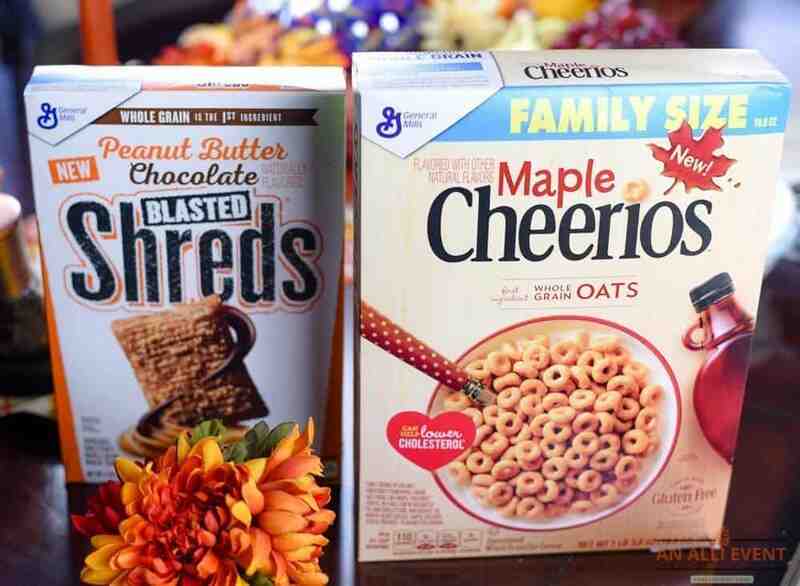 I buy Cheerio’s every single week and will have to try the maple next time. I need to do some sprucing up in my guest room before Christmas holidays guests arrive. Cherrios is something that every family should have. Breakfasts are definitely much easier with them! This cereal would be perfect for my guest and family to have over the holiday season. I can’t wait to give it a try. I saw this cereal in the store and got excited! It sounded like such a great flavor. I’ll have to pick this up next time I’m out. Normally when people visit it’s just cereal for breakfast! Who doesn’t love Cheerios? I haven’t seen the maple ones yet but I liked the pumpkin spice ones. I love your ideas for guests that are coming to visit. I love the idea of Maple flavor because there is something about maple that is just cozy to me, I hope that makes sense. I love Cheerios and all of the flavors are so good! I need to try these soon!! YUM!! These are great ideas. I will definitely keep them in mind as the holiday season gets into swing. Ashley recently posted…Go Inside The World of Ralph Breaks The Internet In Ralph Breaks VR! 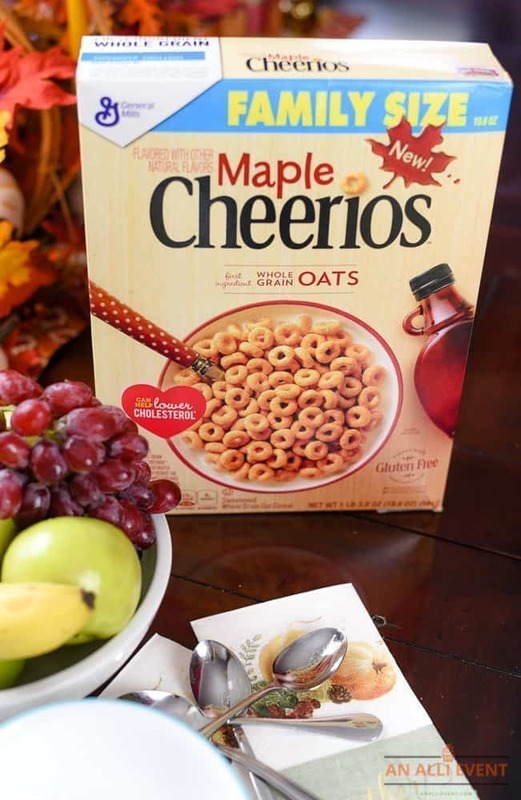 Those Maple Cheerios are seriously giving me all the maple syrup cravings. I would love to try them out soon! Those Maple Cheerios sound so good. I love the flavor of maple. It’s definitely an easy breakfast idea for guests this time of year. I love this time of the year. When we have family staying with us and especially when there are kids, we always make sure to have a few cereal options. Everybody happy! It looks like a nice option of breakfast meal to give to my guest. It looks so delicious and I am sure they are going to like it. I would like to check it out, this maple granola looks perfect for breakfast meal. Not only for guests we can also eat. Love the little touches you include in the bedroom as you spruce it up. Water, chapstick and the wi-fi code. All very important. Chocolate goes a long way as well 🙂 Making a breakfast spread available is also a nice touch as well. I’m a Cheerios fan but have not seen the Maple ones yet? I’ll be shopping this weekend and will seek them out. Great tips for making guests feel welcome!! We love CHEERIOS. They are a favourite here so I need to get ahold of these with maple flavour. YUM!